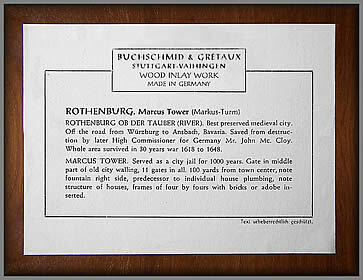 March, adds some more Buchschmid and Gretaux wood inlay pictures to our ever growing B & G database. The two new pictures featured on this page are superb examples of their genre. Although they are forty years old, they look as good now as they did when they left the B & G premises. 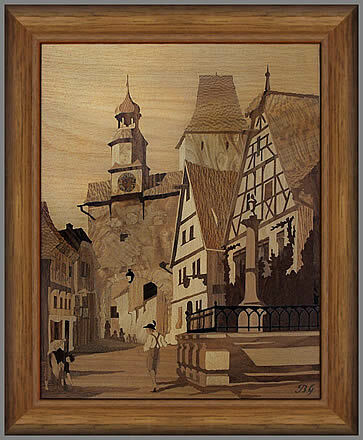 Scroll down the page to enjoy these wonderful marquetry pictures. Our March update brings to you two superb examples from the Buchschmid and Gretaux catalogue. As you can see, time has not degraded these pictures (as happens to so many other similar works). The veneers haven't faded, and, happy to say, they still exhibit their original colouring. This displays admirably the main reason for hanging the pictures out of direct sun light. The bleaching and subsequent colour fading that comes from the effects of the ultra violet band found in the hidden invisible spectrum of natural sun light, hasn't been given the chance to do it's disastrous 'work' on these pictures. Such considered respect these type, or style, of pictures really pays dividends in the long run. As already mentioned, the colours of the veneers don't seem to have faded prematurely. They will of course, change a little with the progression of time and natural aging, but these changes are quite natural and do not look out of place. 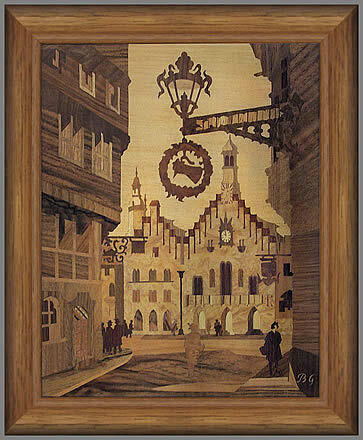 In fact, they often enhance a marquetry picture by presenting a mellowed and warm appearance to the viewer that is most appealing. These pictures have yet to reach that particular stage. The veneers still look wonderfully fresh and vibrant. Although these are two superb examples of the Buchschmid and Gretaux wood inlay work, the present owner is reluctantly obliged to offer them up for sale to a new home. 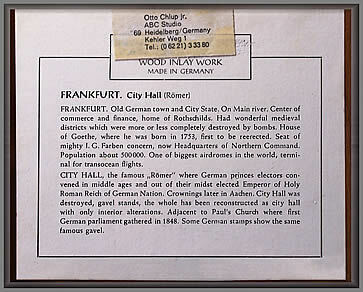 As mentioned before, we do not operate as a market place or agent for the sale of such works through our web site. We will, however, pass your enquiry on to the seller so that you can conduct the transaction between yourselves. We do not offer any other services in this arena. We will only forward your enquiries purely as a goodwill gesture. Click the above button to return to page 16 of "Can You Help"
Click the above button to visit page 18 of "Can You Help"